It was always been a challenge for web developer to built slick, rich and dynamic web applications. We can feel lag... But it's no more now. Try Google Maps. Use the cursor to zoom in/out. Don't you feel the difference? Do you think it does post back for each request? Observe, everything happens instantly with out a page refresh. Wondered! AJAX does it all. HTML is used to build Web forms and identify fields and controls for use in the rest of your application. 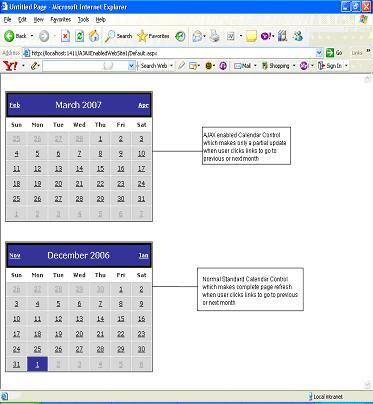 DHTML, or Dynamic HTML, helps you update your forms dynamically. You'll use div, span, and other dynamic HTML elements to mark up your HTML. Everything happens behind the scene a mini request/response cycle with out knowledge of the user. 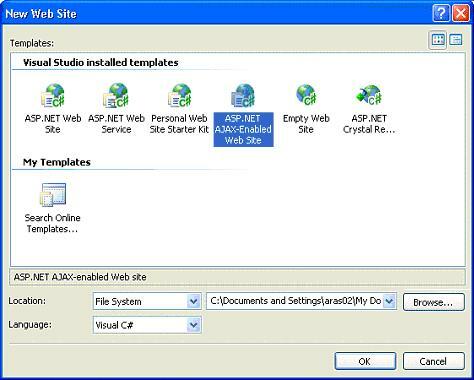 ASP.NET AJAX 1.0 RC can be downloaded from ajax.asp.net when installed; it adds an additional Web Site template for C# and Visual Basic.NET to Microsoft Visual Web Developer. When you create a new Web site project in Visual Web Developer, you will see a dialog like the one shown below. The Web.config will be updated accordingly to be able to use AJAX-based ASP.NET features. Create a New page and add UpdatePanel Control and ScriptManager Control to the page. Click inside UpdatePanel Control and add Calendar Control inside the UpdatePanel Control. Add another Calendar Control outside UpdatePanel Control. Run the page in browser using CRTL+F5. Navigate to the previous or next month in the calendar that is inside the UpdatePanel control. The displayed month changes without refreshing the whole page. Navigate to the previous or next month in the calendar that is outside the UpdatePanel control. The whole page is refreshed. Literally, you can use any control to UpdatePanel Control if you want to AJAXize the Control. Make sure, ScriptManager Control is added to page. AJAX isn't just a hyped technology; instead, it's a concrete framework that can provide you with alternative and clean solutions for your everyday problems when building Web applications. AJAX is about more than creating neat and cool applications; it can truly lead to improved customer satisfaction and a competitive advantage.